The head of the Russian Orthodox Church, Patriarch Kirill of Moscow and All Russia, voiced his hope Sunday that his meeting with Pope Francis earlier in February would decrease tensions between Russia and NATO. 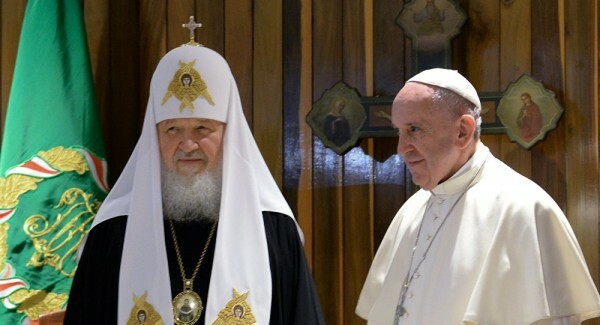 SAO PAULO, February 21 (Sputnik) — The head of the Russian Orthodox Church, Patriarch Kirill of Moscow and All Russia, expressed hope Sunday that his meeting with Pope Francis which took place earlier this month would reduce tensions between Russia and NATO. This was a “meeting between two people who were worried about what was happening in the world, bearing in mind the huge pressure which has developed between the East and the West, to be more precise between Russia and NATO,” Patriarch Kirill told journalists summing up his Latin American tour. “This whole concern turned into a serious conversation which took place with great unanimity on those social issues which seemed difficult for agreement between the Pope and the Patriarch not so long ago,” the head of the Russian Orthodox Church said. On February 12, Kirill held a historic meeting with Pope Francis in Cuba. The meeting marks the first time a Catholic pope and an Orthodox patriarch meet since Christianity split into western and eastern branches in 1054. The Latin American tour, which is taking place on February 11-22, saw the patriarch visit Paraguay, Cuba and Chile, as well as making a detour to the Russian Bellingshausen station on the Antarctic King George Island (Waterloo island in Russian) on Wednesday. NATO has been increasing its military presence in Eastern Europe and the Black Sea since the outbreak of the conflict in southeastern Ukraine in April 2014, in response to what it considers Russia’s assertive foreign policy. Russia has repeatedly dismissed the Ukraine-related accusations leveled at it, warning that increased NATO activities near the country’s borders could undermine regional and global stability.